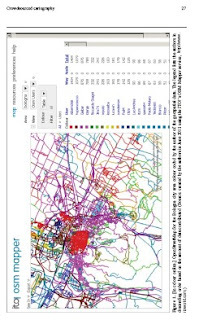 "This paper considers the emerging phenomenon of crowdsourced cartography in relation to ideas about the organisation of contemporary knowledge production in capitalist societies. Taking a philosophical perspective that views mapping as a processual, creative, productive act, constructed through citational, embodied, and contextual experiences, we examine how we might profitably analyse collaborative crowdsourced projects like OpenStreetMap to better understand geographic knowledge production in a shifting political economy and sociotechnical landscape. We begin by characterising crowdsourcing practices in the wider context of Web 2.0, which some commentators assert is rapidly becoming a new, dominant mode of knowledge production. We then contextualise Web 2.0 knowledge production, drawing upon the ideas of sociologist George Ritzer, and his notion of ‘prosumption’, geographer Michael Goodchild’s idea of volunteerist ‘citizen scientists’, and economic commentator Nicholas Carr’s critique of the ‘ignorance of crowds’. We then go on to discuss the changing nature of cartography in the Web 2.0 era with respect to authorship, ontology, representation, and temporality."